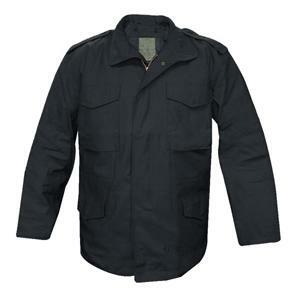 The TRU-SPEC M-65 Field Jacket by Atlanco is extremely versatile and is made of a 9 ounce 50% nylon / 50% cotton water resistant treated sateen material. It is manufactured to U.S. Military specification MIL-C-434555J. It comes with four large snap closure pockets, drawsting waist and hem, heavy duty zipper and a collar concealed hood. There is an included button-in liner. Import.